The ABD architects has a name for competence in the Western standards in architecture and ability to follow them in Russia. It is symbolic, that it is they who undertook the design of the business-centre 'Western Gate'. 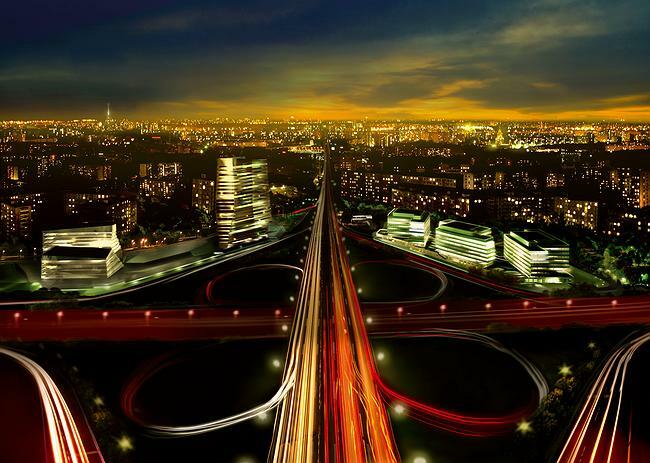 The three striped buildings will be placed by the road interchange where Moscow Ring Road and Mozhaiskoe Highway cross. The facades are evenly belt with continuous windows, and for more elegance they are interlaced with thin stripes of glass. This makes the volumes slightly resemble to nature, to hills and rocks of fine geometrized outlines that have appeared from under the ground within the city. For visible reduction of the volume, walls of every building have spayed corners. This also maintains the effect of rocky landscape: an observer founds herself/himself among caves of the neatly weathered rocks of 'herbal' green tint. The figural perception, vogue and almost subconscious, completes the keen quality and merely foreign rationalism of architecture, oriented on operational reliability. 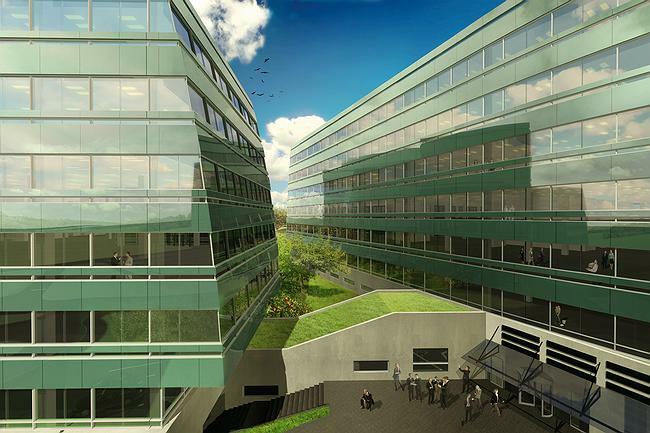 Green stripes and continuous windows will be made in wall panel technology: the external wall of each level is totally factory-made and is fixed right on the concrete surfacing. It is 20% more expensive than crossbar construction but it helps to avoid inaccuracies of erection. It doesn't require the use of work-platforms and the further building maintenance will be of low-cost. Besides, the system allows running of heating and starting the interior decoration on the completed levels. The technology is popular in western countries, but in Russia it only covers 10% of building market. Plan of each building includes central square and corridors, extended on two diametrically opposite sides. From top, it looks like a figure that comes up to zigzag. The plan helped the architect to achieve most advantageous ratio of spaces for rent and additional non-functional area: rentable space makes 93%, which is a great. Alike volumes are placed on different angles. This combination with zigzag brows makes a lively composition, holding up the image of rocky landscape. It also protects the nearby houses from the noise of ringway. Another peculiarity of the project is its ‘hybrid’ typology that combines features of a business-centre, where all the three constructions are on the stylobate with covered ways between, and a business-park, where constructions are separated. 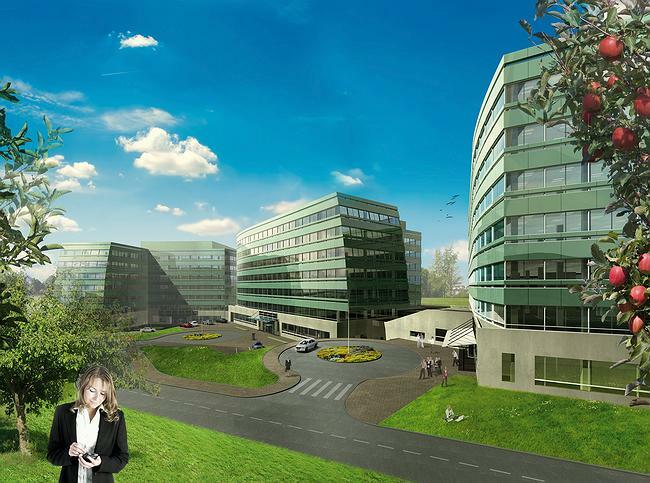 The technique allowed enlarging every construction from usual for a business-park 16 thousands meters to 18 thousands. At that, the volume concept is comfortable for huge and well-established renters. As a rule suchlike buildings has room for two or three companies, or only one. With the knowledge of this, it can be concluded that the three green buildings of the business-park make the economic instrument, perfectly built on stage of architectural project ‘engine for business’. And this is true. But this is not the only value of the complex. The ‘green rocks’ of Western Gates obviously claim to be if not Gates, but definitely the propylaeum of the city. Especially after the second part of Western Gates is built on the opposite side of Mozhiskoe Highway. 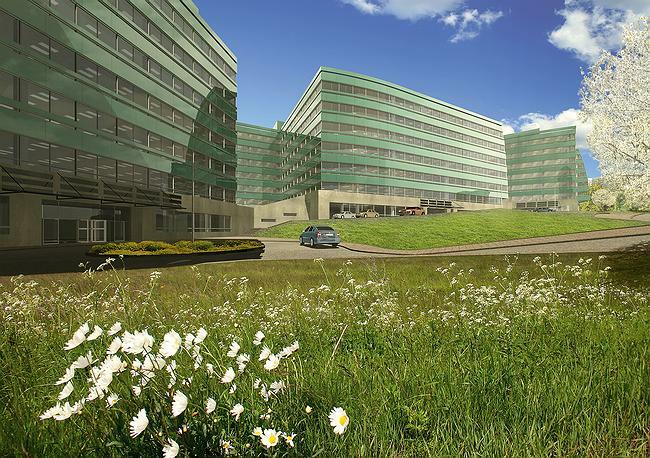 The ABD architects has undertaken the project.